Here is another pup in our “meaty pups” litter of Great Dane/Australian Cattle Dog/LeMutte pups! Pepperoni (a girl whose nickname is “Gecko” because of the shape of the white on her chest) is one of the smaller pups. She is vocal, likes to be at the center of attention, and is playful with the other pups but also very human-oriented. See her full listing, including video, on our DOGS page. Bratwurst and siblings arrived as a Stop the Cycle litter; Forget Me Not has spayed the mother dog (a Great Dane/Australian Cattle Dog mix) and returned her to her owner, and we will now find great homes for the pups. They were born on March 22, 2013. Father is unknown (may be more than one for this litter). Some of the pups look like they may have some Labrador Retriever or Pitbull in the mix, along with a healthy dose of “who knows what” – they are true “LeMutte” pups! The entire litter is very well socialized, and the pups are currently together in a foster home where they are encountering adult dogs, cats, and chickens. They are all curious, outgoing, and very happy, and should do well in every type of home and family. Chachalaca is a really pretty and unusual “dilute torbie” – a pastel tortoiseshell (cream, grey, white) with tabby pattern. She technically arrived as part of a feral colony on which we were doing trap-neuter-return, but she is just too darn friendly and affectionate to spend the rest of her life fending for herself in a colony, so she was promoted to the adoption program. We think Chachalaca is about 3 years old; she is pretty easy-going with the other cats in her room, and although she doesn’t like to be picked up, she LOVES to play and is a great combination of affection and independence. She’d be a great indoor-outdoor cat for just about any type of lifestyle. You can see her full listing, with videos, here! Cacique gets along well with other cats once she gets to know them and they have . . . → Read More: Today’s featured cat: CACIQUE! See his full listing here – he’ll make a great new family member! Dingo is a BIG boy, probably over 100 pounds – we need to get him onto a big scale to find out for sure! He is an Irish Wolfhound mix, housetrained, somewhere between 4-7 years old, and a real sweetheart. See his full listing here – let’s help this big guy find a new home quickly, as he is a bit depressed in the shelter! Austin and Nick come as a team; they are each about 12 years old, and ended up in the shelter after their wonderful, doting owner died without a pet plan in place. These adorable boys are reportedly a poodle mix and a maltese mix, and they are pretty lost and afraid at the shelter. 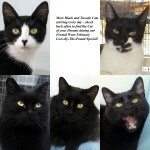 We have them sharing a kennel, and hope to place them together in a final forever home.